I totally agree with you that Google reader is very overwhelming. I also can’t figure out how to make my folders public. If anyone helped you with that, can you please let me know?!?! I really like linkedin, it is hard to get use to. It has some very good things on that website and very good connections! I want to thank you for posting a screenshot of Tweet Deck, I wasn’t really sure about what is was exactly / if it was necessary, but I totally agree with you that if you have multiple twitter accounts (which I do) it is very helpful in staying organized. I agree with you that the copyright rules are kind of a bummer, but it’s important to practice what we preach! And also practice it so we can empathize and understand the problems that our students might run into while they make videos (or any other project that requires copyrighted images). Nice post! 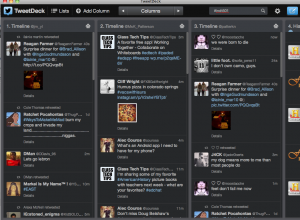 You’ve got me considering getting Tweet Deck myself!